Here we are at the beginning of a new month, so what better time to start the new sew-along, right? OK...technically it's still August 31 here, but I work tomorrow so I'm posting this tonight. If you missed the link to the Charming Stars pattern, you can find it HERE, and if you want to sew along on this, just let me know and I'll add you to the list on my sidebar. Also, feel free to grab the button on my sidebar to add to your blog if you want to. I made time today for some sewing, and now I have four blocks made. They really don't take that long to make, so let's make that the goal for September...to make four blocks. If you want to make more or less than four blocks, that's fine too. It's all up to you. The pattern shows the blocks laid out with sashing and cornerstones, but I just might sew mine up like I have them laid out...without the sashing and cornerstones. I kind of like how the blocks look this way. 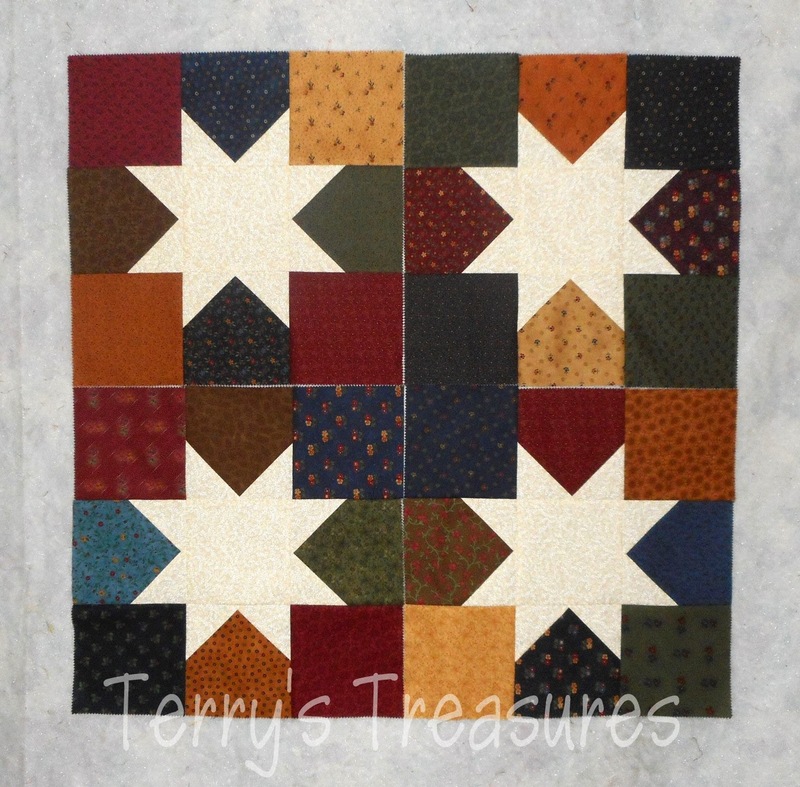 The blocks look great and the pinwheels will make a great border too. You come up with some great ideas. Looking good already!! I have my fabrics ready and probably will set this up as a leader/ender project thru the months. Love the little pinwheels! Looks great and I love your pinwheel idea , that looks fabulous ! I'm in! now to decide what fabs to use :) Thanks for running this sew along Terry! Wow...love your idea for the pinwheel border! And I really love the fabrics you chose! Just gorgeous! Love your blocks Terry, and love your idea with the pinwheels, too. Still trying to decide on my fabric/colour etc!!! 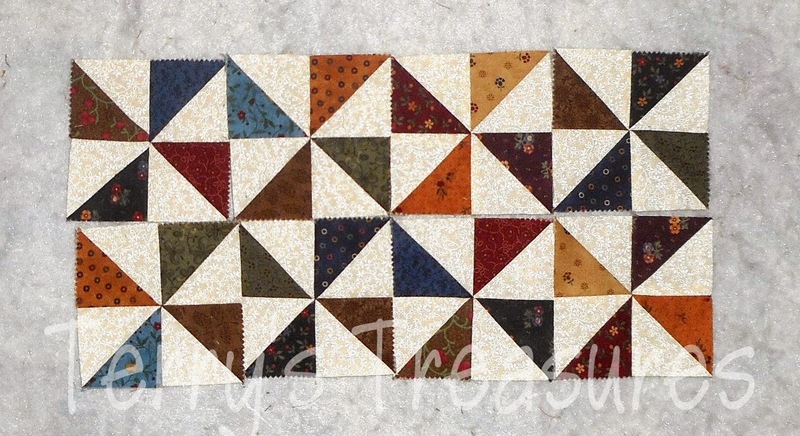 I like the fabrics in your blocks and what a fab idea for the border AND it is made as we sew along . YEH!! The the blocks look great. I love the pinwheels for the border. 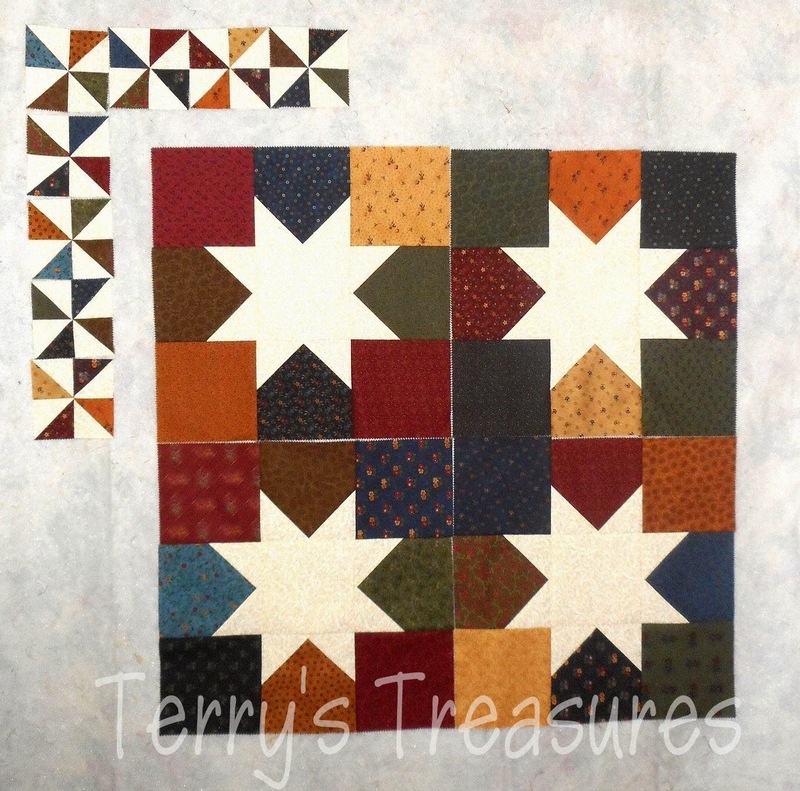 Oh, Terry, you are making it awfully hard not to join in, posting those blocks in such beautiful colors--and then adding that fun pinwheel border. My resistance has weakened, I can tell, but I am still trying to hold on to my resolve not to start a new large quilt this year. Looking good, Terry! Love your border idea. Oh my, I wish I was doing this one - I love it, Terry!!! And the pinwheel blocks make a brilliant border. How fun!!! Hello Terry - I have only just come to your blog, following here from another. I'd love to join in this quilt making, but I already have so much on my table I really must not, unfortunately. This is going to be fun to follow. Unfortunately, I won't be joining you on this one. I love that you are getting bonus pinwheels out of the blocks too. You are so clever with that border!!! I love the colors you used and I agree, they look good without the sashing and cornerstones. I think I'm going to try to do this. I should be able to do 4 blocks in a month. Hmmm,what fabrics to use,that is the question. I know I am rather late in the day but please can I join? Okay, funny that the band is bigger than the stage, is the county growing?? Flowers are BEAUTIFUL! We have a very short growing season, and black flies from Mothers Day thru first frost they make being outside no fun at all. LOVE the way you used the little blocks on the border. I found a yard and a half of a pastel stripe type fabric that I plan on using for the border. With that in mind I've been going through my stash looking for lighter colors for the stars. I also have light blue for the binding and a darker blue for the backing. I found enough of Ivory for the stars. Just finishing up going through fabrics to get started on cutting.